Micron Technology's flash memory subsidiary Lexar this week began shipping its first 128 GB SDXC Memory cards, the highest capacity SD memory media thus far. Lexar says this line of SDXC cards offers a Class 10 speed rating with a minimum guaranteed speed of 20MB per second, also known as 133x. The current maximum speed for SDXC/SDHC is 312 Mbps (UHS-II), which was defined by the SD Association at the beginning of 2011 with the SD 4.0 spec. The Ultra High Speed class (UHS-I), is capable of data transfer speeds up to 104 Mbps. 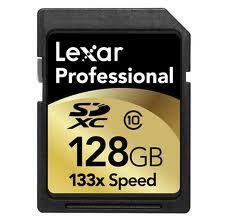 The 64GB and 128GB Lexar Professional SDXC memory cards have MSRPs of $199.99 and $329.99 respectively.